It was only recently, 2011, that I started to venture out on my own away from all the guidebooks’ directions and maps. I opened up a terrain map one day, and studied it; finding what I believed to be waterfalls hiding in the contours. It turns out, I was right. After visiting many waterfalls from guidebooks in Arkansas, I compared where their locations were at and where I believed there could be waterfalls and made a map of my own. I started close to home, The Blue Hole area, which is only 45 minutes from my parents in Conway. I’d get out of class on cloudy, rainy, days and head for the hills near Appleton, Arkansas. There I found tons of waterfalls just waiting to be explored, waterfalls that not many people knew about beforehand. This one in particular was the last one I found on an incredibly strenuous hiking trip, and it ended up being the closest one to the road! It is such a great find and so easy to access. I ended up naming it Schoolhouse Falls in honor of the hollow in which it resides. 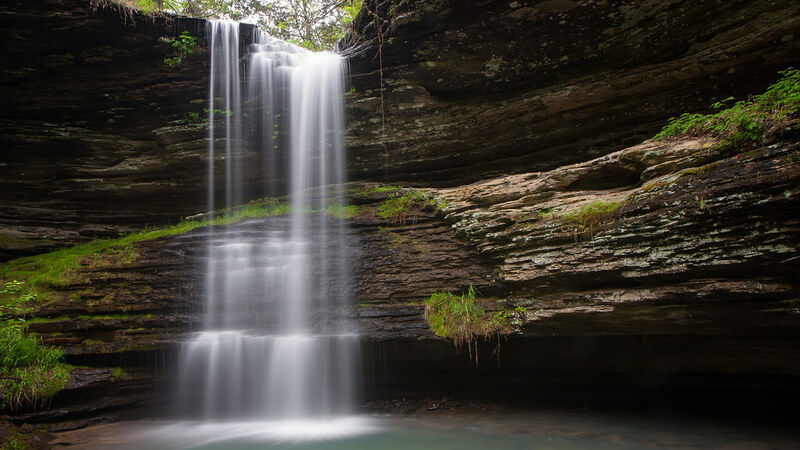 After finding Schoolhouse Falls, I dropped the coordinates to Tim Ernst, Arkansas’ most renowned wilderness photographer, and author to one of the most purchased guidebooks in the state: The Arkansas Waterfall guidebook, aka the photography bible! He explored the area himself and introduced everyone to my waterfalls in his new guidebook. It felt great knowing that I could help to pioneer future adventures to Schoolhouse Falls and into the great Arkansas outdoors. Tell me about your adventures into the Arkansas outdoors in the comments! I, and everyone else, would love to hear about them!